MAJOR PRICE REDUCTION! SELLER WANTS HER SOLD NOW!!! BRAND NEW COMPLETE PAINT JOB, FRESH BOTTOM PAINT AND COMPLETED SERVICED, READY TO ENJOY NOW!!! IN ANNAPOLIS FOR OUR BLUE WATER BOAT SHOW! No Nameis a highly customized, exceptionally well equipped 2009 Hylas 54 Raised Salon, and the newest Hylas 54 on the market. She has AN ENTIRE NEW PAINT JOB, AND FRESH BOTTOM. She's an excellent example of what a quality contemporary performance blue water cruising sailing yacht should be, offering comfort, safety, speed and exceptional strength and finish. She was designed by German Frers for world cruising and built by Queen Long, one of the world's premier quality semi-custom builders. The hull is classic Hylas white with a blue boot stripe. No Namewas built for a highly regardedarchitect who was intimately involved with the builder in pre production build specifications that includedmany custom design upgrades and additional builder options. Examples of extensive customization are a second guest head forward, raised panel woodwork with ebony inlays, bureaus in the master suite, headliners anddining tables. On deck there are 14 custom cleats, redesigned pedestal/console and the aft stanchions have been extended forward to the gates. United Yacht Sales New Jersey would love to guide you through a personal showing of this 54' Hylas 54 2009. 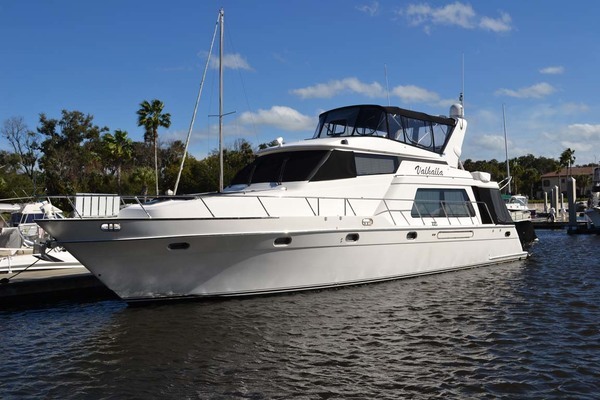 This yacht for sale is located in Annapolis, Maryland and priced at $500,000. For a showing please contact us by filling out the form on this page and we will get back to you shortly! Preferred L-shaped navigation station with outboard facing full size navigation table with storage under,swing out seat, drawer bank and inboard facing computer desk with additional drawers and storage shelves. All instruments and systems are integrated, well labeled inside and out and traced numerically. Solid fiberglass hull construction Twaron (a carbon aramid fiber) reinforcedhand laid with no core and using vinylester resins and Isophthalic gel coat. Watertight collision bulkhead forward of forward cabin with independent overboard drainage. Watertight stern sections across aft lazarettes and stern locker.Molded fiberglass sandwich deck construction. At the bow are double anchors, an electric windlass, a very large sail locker and anchor chain locker.The spacious cockpit contains U shaped seating with very comfortable seat and backrest cushions and a solid teak varnished table with two fold down leaves and teak drink holder. Impressive custom pedestal/console designed by the first owner, includes custom switch panel that allows for monitoring engine navigation instruments and on deck equipment and lights. APC spinnaker - 1.5 oz. nylon, with ATN sleeve, X 3/8 specially designed portraying a flying Canadian Goose thewidth of the spi. No Name is an exceptional, very customized 2009 Raised Salon Hylas 54'. She includes an extensive list of custom features, magnificent varnished teak woodworkand optional equipment. Like her sisterships, she is strong and beautifully finished with quality systems, rigging and electronics. Her exceptional quality is what you would expect from designer German Frers and one of the worlds premier semi-custom Queen Long, exclusive builder for Hylas. All deck hardware is oversized for additional security at sea. BRAND NEW EXTERIOR HULL PAINT WITH FRESHLY PAINTED COVE AND BOOT STRIPES, AND NEW BOTTOM PAINT. SHE'S READY TO ENJOY NOW!